Come PLAY with us at Embark Bash 2019! Join Third Coast Percussion at Center on Halsted's Irving Harris Reception Hall for an evening of music, food, drink, and fun to support "Embark" and Third Coast Percussion's other music education programs. This season's "Embark" programming focuses on PLAY, and we can't wait to share it with you! Alongside students from The People's Music School, we'll explore TCP's latest community-music project, called "The Bell Ringers", which inspired this season's "Embark" curriculum and our Bash theme: PLAY! See how these students transform classroom music-making games into a beautiful piece of music! There will be interactive performances, one-of-a-kind silent auction items, food, drinks, and more. Your ticket goes directly to support TCP's work with students in the city of Chicago. Please consider a "sponsor" ticket to underwrite an entire series of workshops for one student, or a "super star" ticket to underwrite a single workshop for an entire student band or orchestra! Corporate sponsorship opportunities are also available. Contact us for details. 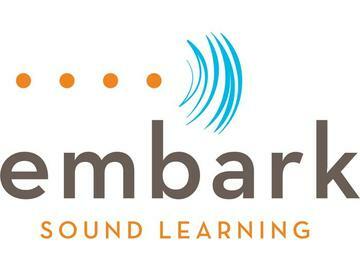 "Embark" is the hometown music education effort of Grammy-winning quartet Third Coast Percussion, bringing special projects that emphasize creativity, collaboration, and inspiration to students in the city of Chicago. Presented in partnership with The People’s Music School, which has been providing free music instruction to Chicago youth since 1976, this program inspires elementary through high school age musicians to take control of their artistic development, teaches them to think critically and creatively about music-making, and builds a sense of community through collaborative creativity. This season's Embark workshops are taking inspiration from "The Bell Ringers," TCP's new project with Danny Clay, which focuses on ideas of "play" and community-building. Special thanks to our Premier Sponsor for this event, Foley & Lardner, LLP! Major support for "Embark" comes from The Robert & Isabelle Bass Foundation and the Julian Family Foundation, as well as a grant from the City of Chicago Department of Cultural Affairs & Special Events CityArts Grant Program, and the generosity of Third Coast Percussion fans like you.